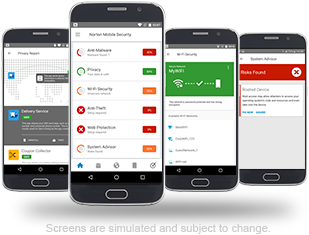 App Advisor+ proactively helps protect your smartphone against mobile threats like malware, ransomware, adware and privacy leaks using our award-winning2, patent-protected app scanning technology. Web Protection helps detect and safeguard you from navigation to fraudulent and malicious websites when using your preferred browser, app, SMS, MMS, email and social networking sites. Free apps are good at telling you what benefits they provide, but they may not tell you their real “costs”. 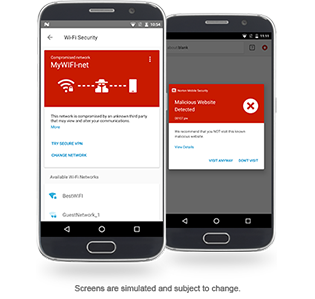 App Advisor+ (powered by Norton Mobile Insight), when turned on, automatically lets you know about malware, online privacy and other risks that are detected before you download from Google Play™ to help you make informed app decisions – and whether that free app is worth the final cost. Our Web Protection feature helps detect fraudulent and malicious websites when using your browser, app, SMS, MMS, email and social networking sites to help safeguard your activity and personal information. Norton Mobile Security is powered by our cyber intelligence network system developed by Symantec’s Security Technology and Response (STAR) Team. 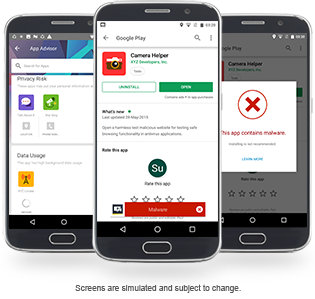 This includes Norton Mobile Insight, our proprietary app analysis system that includes crawling the app stores, analysing running apps and using machine learning to understand Android app behaviours. Our engineering team strives to bring our valued members additional device, network and information protection in this increasingly unsafe cyber world. 4 Auto-scan of apps on Google Play supported on Android 4.1 or later except for Samsung devices. Samsung devices running Android 4.2 or later are supported. For earlier versions of Android, the Google Play "Share" function must be used to scan apps on Google Play.